The Netherlands have exposed a growing division in the European Union after refusing to take in migrants who were rescued in the Mediterranean unless other member states are willing to do the same. The change in some European countries from a big open-door welcome to migrants to the closing of borders is an increasing problem for the globalist Brussels elites. Too much crime, jihad threats and chaos have been transported into the EU with the immense Muslim migration, as should have been expected. However, the recent unexpected outbreak of violent protests in Belgium over the migration issue, and the subsequent government collapse (accompanied by a surge in nationalism), was telling. There is still a widespread belief that the EU is somehow solely responsible for migrants. The Muslim countries near Europe have long ago washed their hands of any responsibility for the Muslim migrants, without any rebuke or even acknowledgement from the mainstream media that they have done so. “Those who help the Muslim illegal aliens, hate Italians,” Matteo Salvini said, blasting his opponents on Facebook and Twitter. The times when mayors of Palermo, Florence and Naples could cash in on illegal migrants are over, said Salvini, vowing that those resisting the new policies will answer before law. RT Salvini, the deputy prime minister and interior minister minister from the conservative Lega Party promised that the rebelling city heads will “answer before law and history.” And it’s no idle threat, as the former mayor of the Calabrian town of Riace is currently under house arrest on charges of aiding and abetting illegal immigration. “Certain mayors look back fondly on the good old times of mass illegal immigration, but for them the party is over!” Salvini said. By “certain mayors” he meant the heads of Palermo, Florence and Naples, who he gave the choice of resigning from their posts. 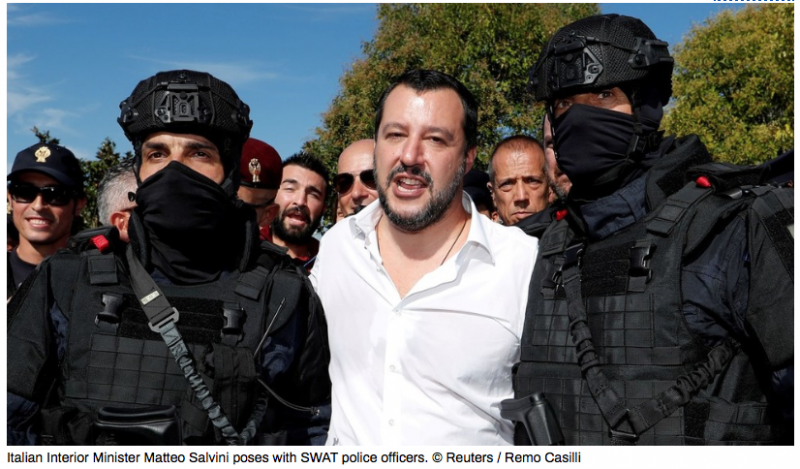 The three mayors insisted that some parts of Salvini’s security decree aimed at curbing illegal migration to the country were unconstitutional and that they would refuse to follow them. According to the new decree, migrants can no longer apply for full residency after a two-year asylum stay – but Palermo mayor Leoluca Orlando wants his city to continue this practice. Denying migrants access to health care and other essential municipal services would have an opposite effect and put them on the path of crime instead, he argued in the interview to the newspaper La Repubblica. His resistance to the decree was “not an act of civil disobedience or conscientious objection, but the simple application of the constitutional rights that are guaranteed to all those, who live in our country,” Orlando said. He also announced plans to take the anti-migrant rules to the Constitutional Court for the judges to rule on how they comply with Italy’s principal law. Naples Mayor Luigi de Magistris said on Thursday that he was going to open the city’s port to Sea Watch, a NGO ship that had been involved in rescuing migrants trying to cross the into Italy on rafts and rickety boats. The vessel has been stuck in the stormy Mediterranean for more than two weeks now, with 32 asylum-seekers onboard. Following his comments, Salvini reiterated that that all the ports in Italy were closed to migrant-rescuing ships. Salvini got his post after the euroskeptic coalition government came to power last year, with the migrant issue playing a key role in the success of Lega Nord and Five Star Movement at the polls. The new government pledged to deport 500,000 migrants that were in the country. Italy has become one of the prime destinations for asylum-seekers from Middle East and North Africa after the Arab Spring shattered many countries in the region.